Go169 is a free game for PalmOS 5. 320*320 resolution with 8-bit colours. No warranty. Play against your Palm! Go169.exe needs to be run from a separate interface program that supports GTP, such as Drago or GoGui. 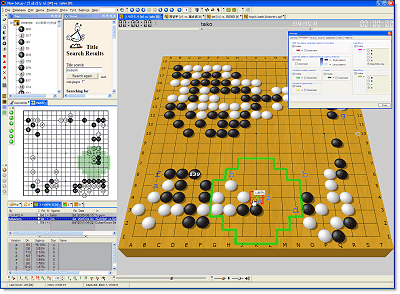 Go169 is a program which plays the game of Go (also known as Weichi or Baduk). The 169 in the name refers to 13x13 which is the recommended board size. Go81 is an earlier version of the same program. Use the pointer to play. You can choose the players, the board size (9x9, 13x13, or 19x19), the number of handicap stones, komi, and Japanese or Chinese scoring by selecting the options from the menu. The program scores the game after it is finished. After the game has ended, you can return to the option menu by tapping the board anywhere. You can also undo the last move, estimate the score or resign during the game by using the menu. Thomas Maure fixed a bug that caused crashing. First release. Compared to Go81 it adds the 320*320 resolution, stronger AI, and 19x19 board support. It no longer supports low resolution and gray-scale devices. You should update to version 1.0. If that crashes, too, you could report it. Try to rescore by selecting score from the menu. Unfortunately the scoring is not always correct. The Go-Playing Program Called Go81. In the proceedings of the Finnish Artificial Intelligence Conference, STeP 2004, Helsinki, Finland, September 1-3, 2004.